Princeton Day School (PDS) sophomore Tag Quijano was delighted to hear that he was going to receive a 2014 Sustainable Princeton Leadership Award but disappointed that he had to miss the award ceremony at the Princeton Public Library last Thursday, January 29. The 15-year-old had good reason for his absence though — he was attending a model United Nations conference in Philadelphia. Along with fellow PDS students Zach “Woogie” Woogen and Kate Yazujian, both seniors, Tag was honored by Sustainable Princeton and the Princeton Environmental Commission for collective efforts that resulted in an annual Harvest Dinner for 250 people as well as a Student Environmental Conference. They were also part of a Greenhouse Gas Assessment team. All three are participants in the national Student Climate and Conservation Congress run by the Green School’s Alliance. Tag is also a member of Princeton Scout Troop 43, and his contribution to the PDS environment was an innovative Eagle Scout project that would achieve sustainable change through engineering and design. With the help of a team of scouts and other PDS students, Tag built a Human Powered Rain Water Delivery System of his own design for the school’s teaching garden. Using a donated bike on a platform constructed from recycled wood pallets, Tag’s project collects rainwater thereby reducing the amount of tap water used to irrigate the garden’s crops and flowers. Pumps powered by the bicycle rider, take the rain water to where it’s needed. The impact of his Human Powered Rain Water Delivery System is something that Tag hopes to spread to other schools and communities. Plans for the system are available on the Troop 43 website (www.princetontroop43.org). “I want the project to be replicable in other schools and gardens, and that as many students as possible have the opportunity to learn from it,” said Tag, who hopes that students will learn to be stewards of the land and its resources. It’s a mission that aligns with the Scout’s “Leave No Trace” ideal. So it’s no surprise to learn that Tag is the “Leave No Trace Instructor” for Troop 43. His commitment to environmental issues has taken him on two occasions to the Student Climate and Conservation Congress, which exists to empower outstanding student environmental leaders with the skills, knowledge, and tools to address climate change and the challenges to the Earth’s natural resources. Concern for the environment as well as scouting seem to run in the family. Tag’s older brother Max, 26, who now lives in Belize where he owns a solar light company, was a scout. 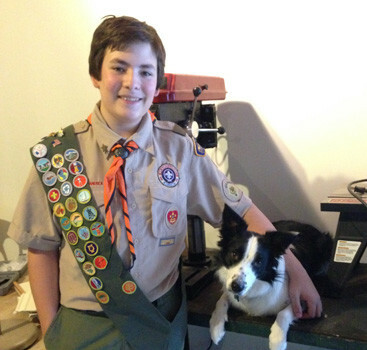 His sister Grace, 13, is a girl scout cadet and his younger brother Chase, 11, is currently a Webelo cub scout who will be jointing Troop 43 in the spring. Both of Tag’s younger siblings attend the Princeton Friends School, where, following the success of his Human Powered Rain Water Delivery System at PDS, he plans to build a second system for the school garden. For more information on Troop 43, scout, visit www.princetontroop43.org. For photographs of Tag’s project at Princeton Day School, visit: www.princetontroop43.org/eagle-projects/tag-quijano/tag-quijano.